Drinking water is of course essential to good hydration, but the benefits that you get when you add lemon and turmeric are wonderful for your body. Water is recommended for those who are looking to lose weight as the first thing to try when feeling hungry, because it can give us both that feeling of fullness in our stomachs and also eliminates the possibility that we might just be thirsty, not hungry. Obviously, our bodies need water to survive and thrive, so getting plenty of fresh clean water daily is good for us. Water gives our cells volume and makes it possible for the nutrients that we need to be dissolved and used by our cells. How much water we need daily can vary by the climate you live in and your activity level, however, a good rule is 8 ounces of water 8 times per day. This equals roughly half a gallon of water or 2 liters. In dry climates or with heavy perspiration, you may need to drink even more. In this article, we will look at the benefits of these two important ingredients that you can add to one or more of those 8 8-ounce glasses of water each day and what happens in your body when you add lemon and turmeric. The benefits or turmeric are incredible, and if you are considering an herbal supplement, it is one of the best you can start with. Turmeric is a wonderful help to your body because it is a powerful antioxidant, anti-inflammatory, antiviral, antibacterial and anticancer agent. With all of this illness fighting power packed into one golden yellow spice, turmeric should be a household illness-fighting staple that has earned a place in the medicine cabinet. Turmeric has been used for centuries to treat everything from acne to diabetes, from gas to high cholesterol, and it does all of this with very few side effects or potential health risks to your body. However, if you are trying to get pregnant, talk to your medical professional before using turmeric as it may help to prevent pregnancy. Although the health benefits for treating disease are huge with turmeric, the health prevention properties are also a very important reason to add this spice to your drinking water daily. For example, researchers have found that turmeric has helped with the prevention of Alzheimer’s disease. The research shows that turmeric prevents the degradation of neurons in the brain, which helps prevent the symptoms of dementia and memory loss. Drinking lemon water with turmeric can be done on ice, hot like tea, in the morning, in the evening, with or without a meal to accompany it. The benefits are going to be absorbed by your body no matter when or how you take in this interesting flavor combination. The bright yellow, sunny appearance of a lemon is similar to the feeling that your body gets when you add fresh squeezed lemon juice or even just a slice of lemon to your water. Your body feels more alert, refreshed, and vibrant. The burst of tart flavor is like liquid sunshine invigorating your body’s systems. Lemon and all citrus fruits are high in Vitamin C, which is excellent for your skin’s health. Lemon juice also gives you some soluble fiber, potassium, folate, calcium, thiamin, niacin, vitamin B6, phosphorus, magnesium, copper, riboflavin, pantothenic acid and a variety of phytochemicals, which are all important for our health. Citric acid helps digest food better due to the added breakdown in your stomach. This leads to less gas, constipation, and bloating and also helps with the absorption of nutrients from your food. Researchers looking at heart health and lemon found ‘a significant association between vitamin C intake and protection against cardiovascular mortality.’ Vitamin C intake is also associated with bone mineral density, which can help prevent osteoporosis. So how much turmeric to how much lemon should you add to your water every day? 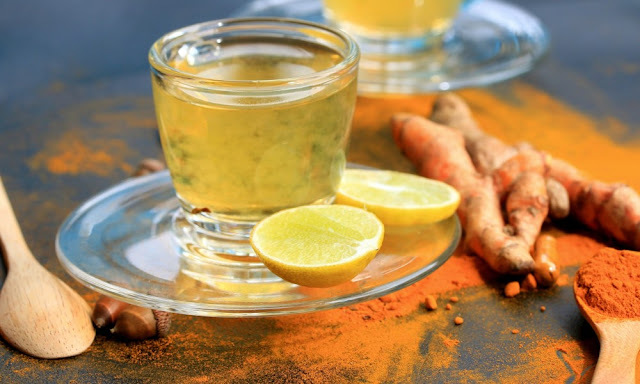 As little as a ¬ teaspoon of turmeric is enough to get the benefit from this remarkable spice, but you can drink more than that if you would like. Add the juice from a half of a lemon and mix both in an 8 ounce glass of water. The result will be a brownish yellow liquid that you can drink. Some people are not a fan of the flavor combination and if that is the case, add some honey or cinnamon to the mixture to give it a different flavor. Alternatively, try some fresh mint to give it a refreshing taste. Warm water will help the turmeric dissolve better, but you can let it cool a bit before drinking it. Enjoy this healthy drink every day for some incredible health benefits.